We offer several opportunities to get your company information out to the healthcare compliance community. Our audience consists of thousands of professionals, including more than 12,000 HCCA members. Advertising opportunities include print and digital media ads. For more information about advertising, view the HCCA media kit. 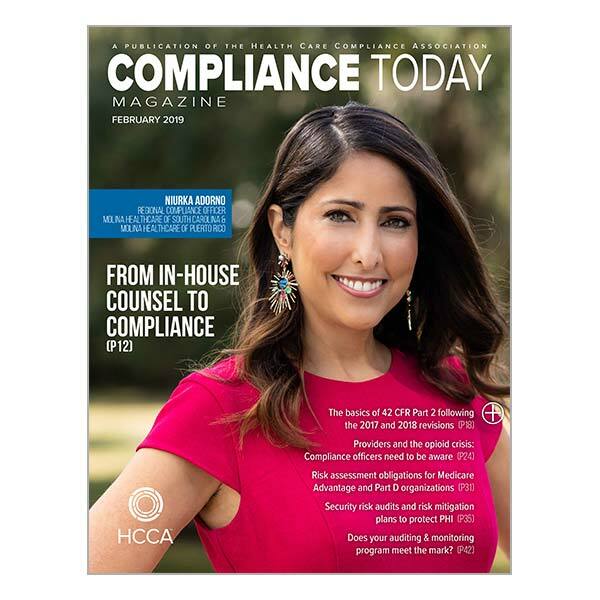 Established in 1999, Compliance Today is our monthly publication available only to our 12,000+ HCCA members. Each issue provides the latest information on healthcare compliance news, including enforcement actions, new and changing regulations, HCCA news and events, and compliance program management. Our website is visited by more than 235,000 visitors a month. Advertise on our site to take advantage of this concentration of members of the healthcare compliance profession. Advertising options include banner ads that link to your website. Compliance Weekly News (CWN) is HCCS’s free e-newsletter, for members and non-members alike. It delivers the latest news on regulatory changes, compliance procedures, and enforcement in healthcare compliance. CWN is emailed to more than 15,000 subscribers each week. HCCAnet is the social network for the Health Care Compliance Association. Advertisers can gain access to more than 12,000 registered users. Sponsor a discussion group and get exclusive advertising rights in that space. Target your ads to a specific discussion group to target a tightly segmented audience with a specific interest for higher conversion rates.